The documentary film, REMEMBERING THE ARTIST ROBERT DE NIRO, SR.
premieres on HBO June 9, 2014, with subsequent showings throughout June, check local listings. 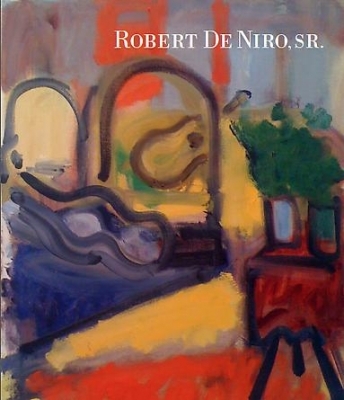 By the early 1950s, Robert De Niro, Sr. (1922-1993) had arrived at his boldly expressive mode of painting. Through strong color and reductive shapes, he merged aspects of abstraction and representation in figure paintings, still lifes, and landscapes. DC Moore Gallery is pleased to present an exhibition of his vibrant art, featuring paintings and drawings from 1955-1989. A catalogue with an essay by Robert Kushner will be available. It will also include an article on the artist by Eleanor Munro and photographs by Rudy Burckhardt that first appeared in ARTnews in May 1958. Characterized by his use of color, gesture, and movement, De Niro’s art is grounded in the act of painting and drawing, bridging European modernism, especially French, with Abstract Expressionism. He also often referenced European masters from Delacroix to Matisse. With his extensive knowledge of art history, he sought to maintain the tradition of representational painting that was under attack by the tide of abstraction championed by many artist and critics in the 1950s. By no means a traditionalist, though, De Niro followed his own uncompromising vision of emphatic painterliness and personal experimentation. A fine example of this is Woman in Red of 1961, a bold, large-scale rendering with freely brushed areas of color and a figure defined by black outlining, a signature feature of the artist’s work. He also painted striking still lifes and interiors, such as Birdcage, Two Vases, and Flowers of 1981, a strongly abstracted work in which thick black lines describe objects in a room filled with quickly applied areas of vivid color that enliven the space and provide balance to the composition. He had studied with Hans Hofmann in New York and Provincetown, and Josef Albers at Black Mountain College, North Carolina, in the late 1930s and early 1940s, and then worked for five years at Hilla Rebay’s legendary Museum of Non-Objective Art. In 1945, he was included in a group show at Peggy Guggenheim’s Art of This Century in New York, which was a leading gallery for the art of both established European modernists and members of the emerging Abstract Expressionist group like Jackson Pollock, Mark Rothko, Robert Motherwell, and Clyfford Still. He had his first solo exhibition there in April and May of the following year. Beginning in 1950, De Niro had a series of exhibitions at the Charles Egan Gallery in New York, which also showed the work of Willem de Kooning, Franz Kline, Philip Guston, and others. He participated in many important exhibitions such as the Whitney Museum Annuals, Stable Gallery Annuals, and the Jewish Museum’s celebrated 1957 show, Artists of the New York School: Second Generation. By the early 1960s, De Niro’s painterly expressionism was increasingly being overshadowed in the public eye by new trends like Pop Art and Minimalism. Undaunted, he created his powerful compositions in rich, post-Fauve colors for another three decades. He was awarded a Guggenheim Fellowship in 1968, and continued to exhibit at galleries and museums throughout the United States. Today, when the art world has opened to a larger range of artistic perspectives, De Niro’s many accomplishments and unwavering dedication to his personal artistic vision can be more readily appreciated as a singular achievement in postwar American art. Robert De Niro, Sr. has work in many museum collections, including those of the Metropolitan Museum of Art, Brooklyn Museum, Smithsonian American Art Museum, Hirshhorn Museum and Sculpture Garden, Corcoran Gallery of Art, and Whitney Museum of American Art. In 2009, a retrospective of his work was presented at the Musée Matisse in Nice, France. DC Moore Gallery is the exclusive representative of the Estate of Robert De Niro, Sr.
An HBO documentary film, REMEMBERING THE ARTIST ROBERT DE NIRO, SR., is a portrait of the esteemed figurative painter which includes interviews with the art historians and critics, Robert Storr and Irving Sandler, and with the man who knew him best: his son. In intimate conversation, Robert De Niro, Jr. profiles an artist whose talent went largely unrecognized as the pop art movement swept the nation in the 1960s, and looks at the relationship between a father and son. Directed by Perri Peltz (HBO’s “The Education of Dee Dee Ricks”) and Geeta Gandbhir (Emmy®-winning editor of HBO’s “If God Is Willing and Da Creek Don’t Rise”). An official selection of the 2014 Sundance Film Festival, the film debuts on HBO on June 9. Artforum Review: Robert De Niro Sr.
Financial Times: Portrait of an artist: Robert De Niro Sr.
ARTnews: Now Starring: Robert De Niro, Sr.